Yes, I’m still plowing through my GLF gunny sack embroidery project. And I’ve gotten past most of the difficult parts of the project. 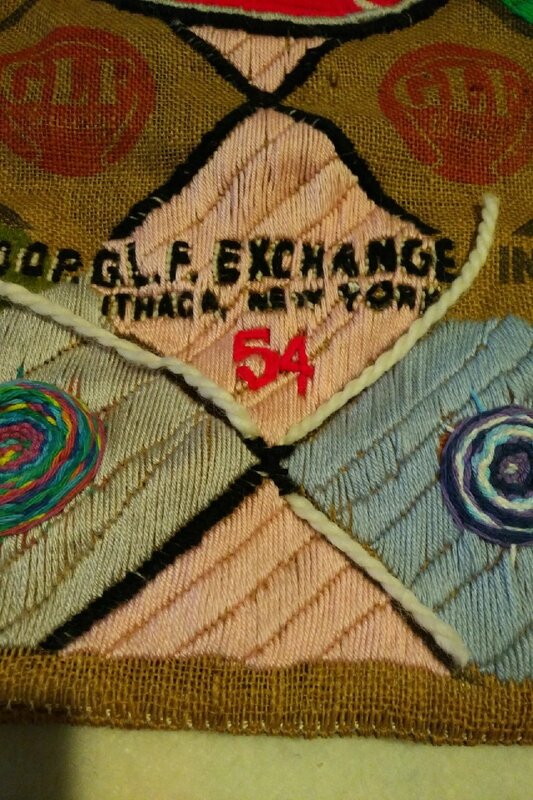 Yes, it took a couple of weeks to stitch up that GLF Quality logo of days past … but I’m making progress and that’s important. As you can see, I’ve completed the center logo, and have stitched over several of the squares. I decided that if a square started with one color, the square immediately above it should contain that same color. I chose bright colors like greens and yellows and baby blanket blue, and you can see that it looks rather cool right now. But I have one part of the project that’s going to give me major fits. Right – down – here. Look at the picture. 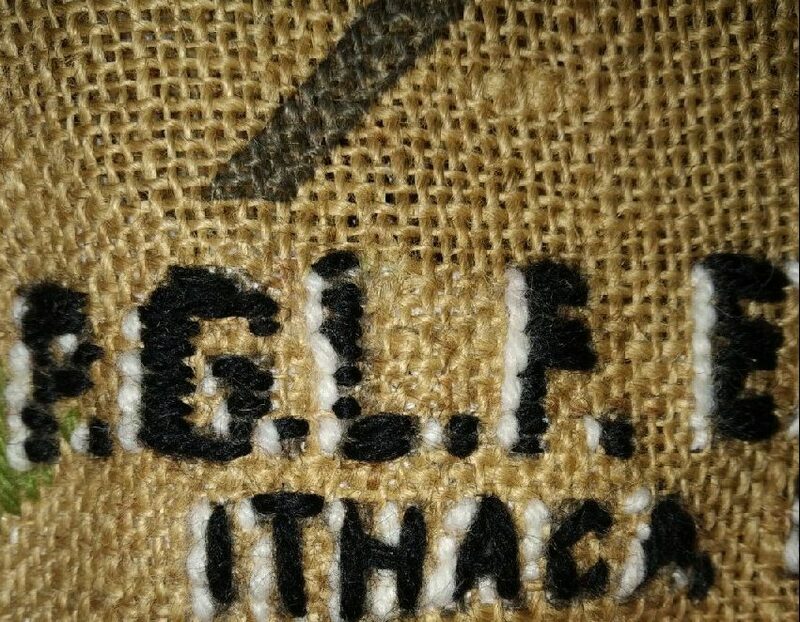 You can see, at the bottom of the gunny sack, something that says “COOP G.L.F. EXCHANGE, INC., ITHACA, NEW YORK” along with a red “54”. Yeah, it kinda breaks up the geometric pattern on the burlap front … and I thought about embroidering over the lettering and covering them up … but in the end, I decided to keep the lettering as is. I added a white “drop-shadow” stitch to the left of each letter, and then stitched up the letters themselves in black yarn. There was a red “54” in the square as well … a little hot pink neon yarn should make those numbers sparkle. I need to add some yarn to the background. I can’t have bare burlap on this project. It’ll look tres gauche. And I don’t need this project looking tres gauche. Not even le petite gauche. So I added a square of baby blanket pink yarn through the background, stitch by stitch, strip by strip. 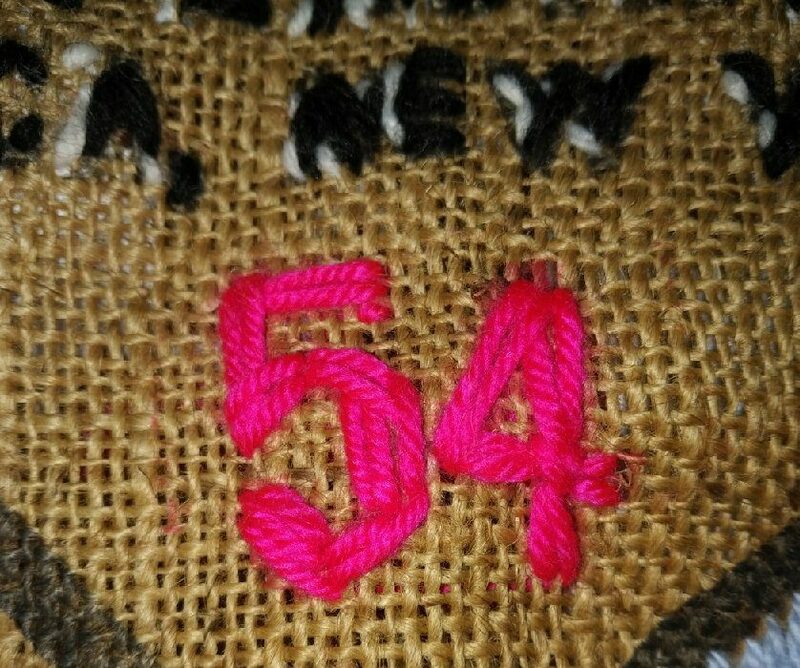 When I came close to the “54”, I threaded the pink yarn under the hot neon red yarn, to give the “54” a nice three-dimensional appearance. And you see that nice rope-like white yarn? This is the same technique I used to create the black raised perimeter around the border of the big GLF Quality logo. I took white, rope-like yarn, and stitched it down with thin black yarn. And on areas where the squares intersect, I stitched those areas by using the same stitch across the intersection. This allows me to keep the loose, unstitched yarn in place so that I can work on other objects. 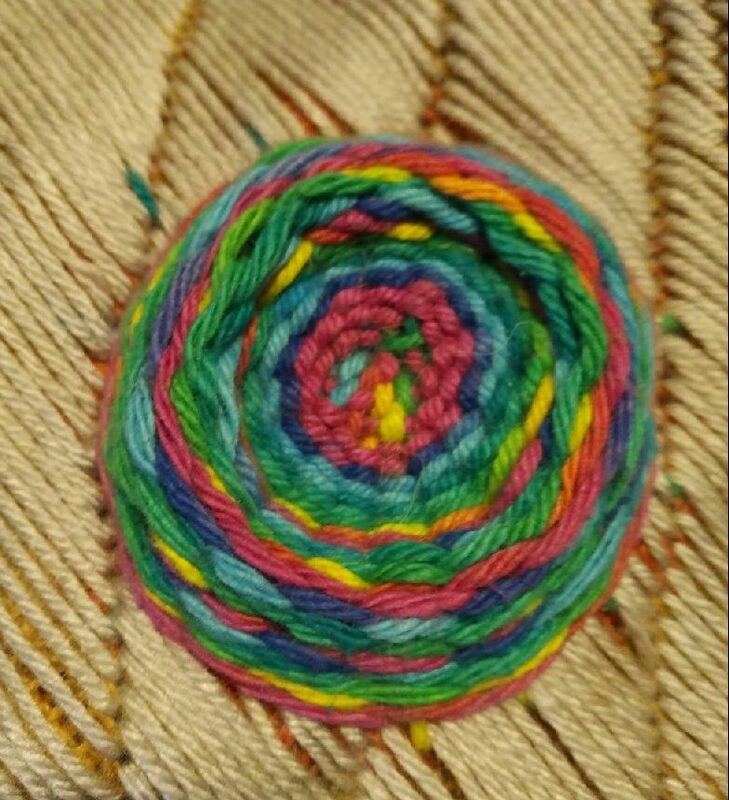 Another cool trick I learned – if you use the yarn that changes color throughout, and you use it for creating the center rosettes for every square here … it has a nice effect to it. Such as this rosette I finished this week. 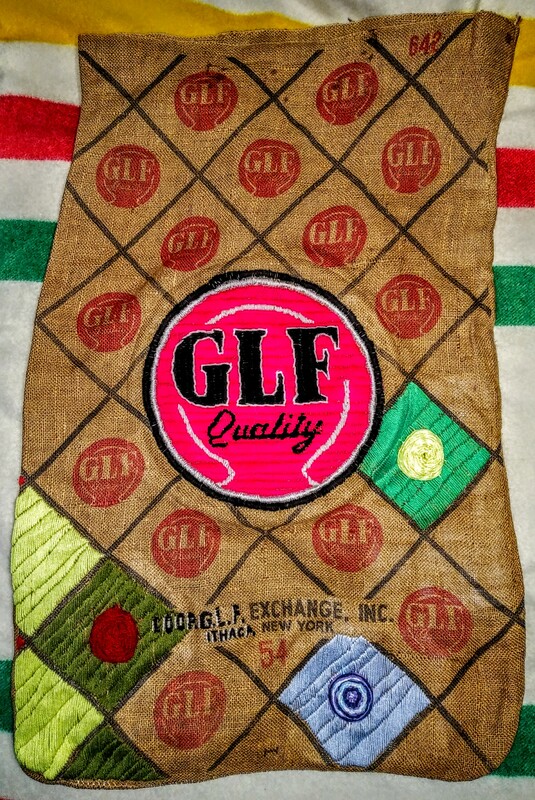 These rosettes are being stitched in place of the smaller “GLF Quality” logos in the small squares. Once I add a rosette, then I stitch up the background with a different colored yarn. And having stitched up the text at the bottom of the burlap bag, I could stitch the background yarn right up to (and through) the lettering. Of course, while I’m working on this project, I’m checking the interwebs for any other GLF ephemera. And surprisingly, I found some. 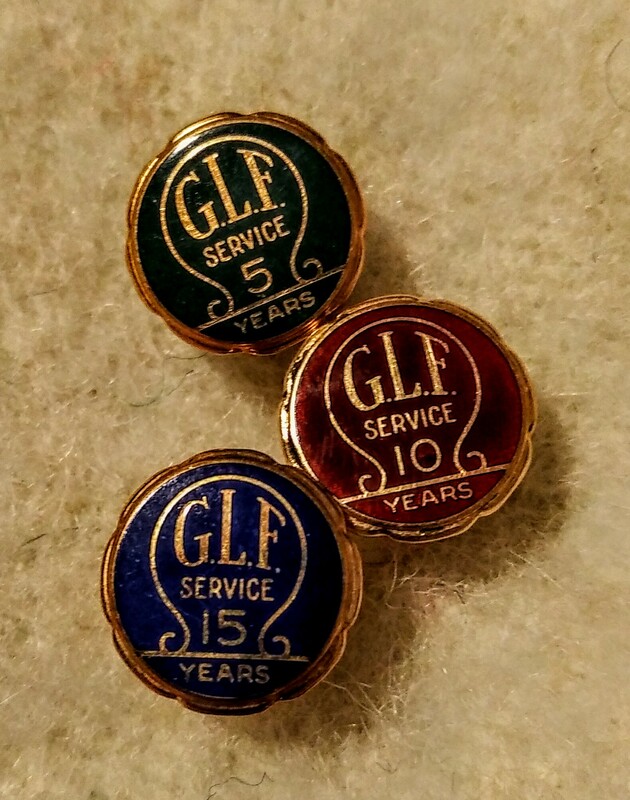 Thanks to a pair of eBay auctions, I acquired three GLF service pins – they were awarded to employees for 5 years, 10 years and 15 years of service. I don’t know if there were any other pins in the series, but these are nice little treasures for my personal collection. Each one of these pins has a screw-back, so I suspect these were worn on employee lapels and blouses as a sign of employment longevity. I should stress, however, that these pins are NOT going to be integrated into my project. No way no how. What I’ll end up doing with these pins is most likely mount them in a frame, along with a vintage GLF advertisement. Something simple and classy. It’s February 9, 2018. Here’s where I’m currently at in this project. Two squares away from completing the bottom row. And then it’s just stitch, stitch, stitch. 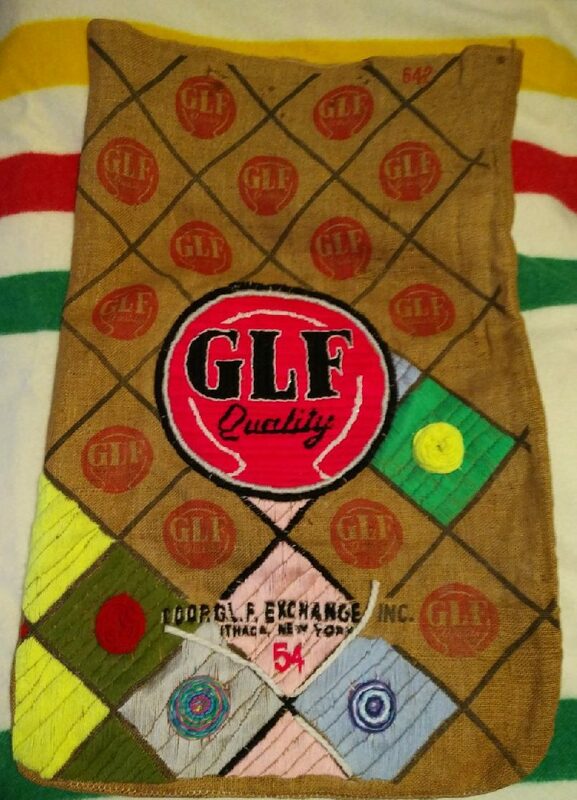 I’m figuring that if I keep doing a little bit here and there every day, I may complete the squares that are below the big GLF Quality logo by the end of February. Maybe by mid-April, I can have the entire project done. Talk about your rainy day projects that shine like sunshine. I am so impressed with your needle skills! This is looking amazing. this can be entered in the nys fair in some category, right? There is a category or three in the NYS Fair that might accept something like this. different weights of threads and yarn. I know you have “Golden hands” ..my Grandma and maybe yours would have said it in Yiddish..as a compliment! What a cool effect with the rosettes and variegated yarn! I can’t put a finger on why, but it really reminds me of quilts made by my great-grandmother.